There are two types of email templates, the built in ones and the custom ones. Built-in ones are automatically emailed by the system on events like booking created, payment created, etc. and we give default templates for them. 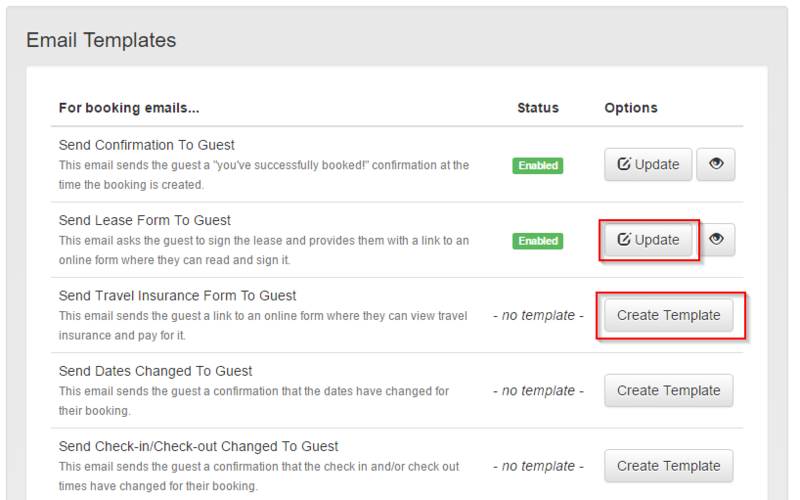 Custom templates can be triggered based on criteria like number of days before booking or manually sent. For the built-in ones, go into the email templates section and you can add a template to each one to override the default template we send. Hit the Create Template button next to the template type to create one for that, prepopulated with the default content for that event. Use the Update button to change one if you've already got one in place. The eyeball icon lets you preview your template. For the custom templates/triggers, those are basically emails you can configure to send either a certain number of days before/after arrival or manually send them whenever you want. Here's an article on doing some detailed setup: https://www.ownerreservations.com/support/articles/pre-arrival-email-templates-triggers-custom-fields. If you don't need to paramaterize the email template to say different things for different properties, you can ignore the custom field definition part at the top and just build the email template and trigger.